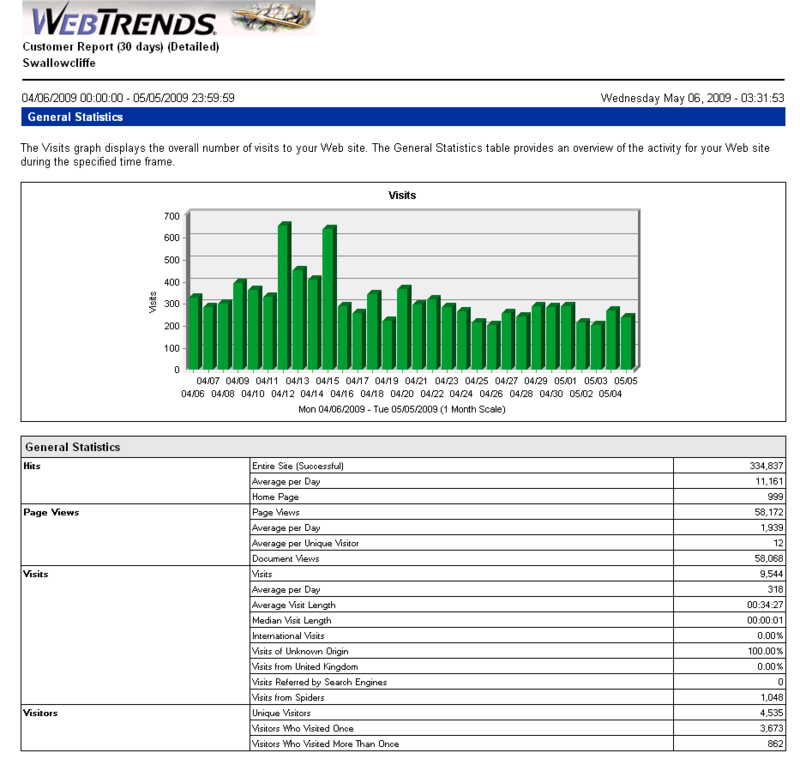 When you host your Website with Cravenplan you automatically receive the Webtrends Website statistics package. 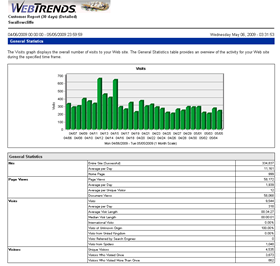 The WebTrends statistics package gives you a 30 day rolling report that provides you with information about who is visiting your Website along with a whole host of other useful information - it is updated every night. 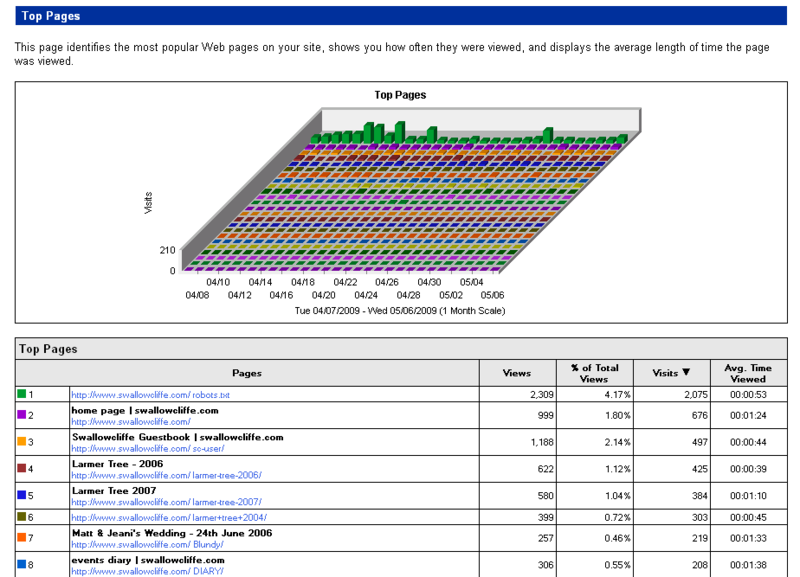 When you visit your Websites statistics page you will notice a table of contents on the left hand side of the screen. 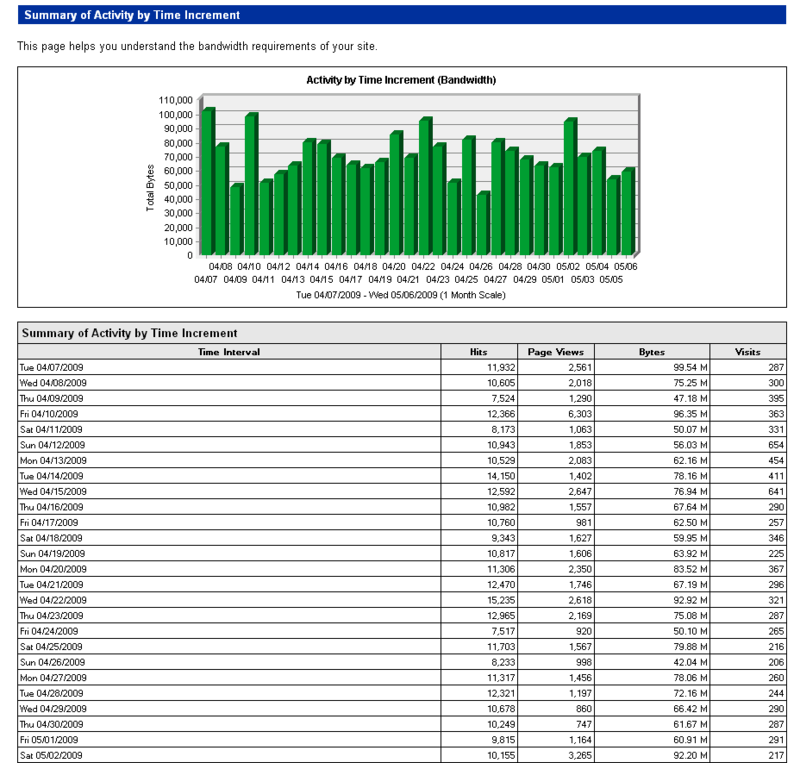 These can be used to navigate through the statistical information on the page. For a live example take a look at the statistics for our village Website. The general statistics table gives you a brief summary of the different things that happen when someone or something visits your Website. People are not the only visitors to your Website - your site will also receive visits from small programs called spiders or bots. These are used by the search engines to look at the information on your Website and to update any changes in the search engine results. People often confuse 'hits' with 'visits', but hits are the number of files that have been called from our server. If you have a page with 5 pictures and some text then you will get 6 hits from that 1 visit (1 each for the 5 pictures and 1 for the page including the text). Hits are not a good way of tracking the number of people to your site but can be good to impress. 'Page views' are the number of pages that have been viewed by visitors to your Website. It is not unusual for one visitor to look at a number of pages on a Website, especially if it is an e-commerce Website. Lots of page views are a good sign that a visitor likes your Website or is looking to buy products or services. 'Visits' are the number of visitors to your Website This is one of the most important statistics for your Website as it gives you an idea of how many visitors are looking at your site The visitors aren't always human, some visits are generated by search engine spiders. The visits report is split so you can see how many times the site was visited and the average length of time each visit lasted. Note that this set of figures will also include the spiders quick visits and so the actual times for people who visit are often longer than the average time shown. 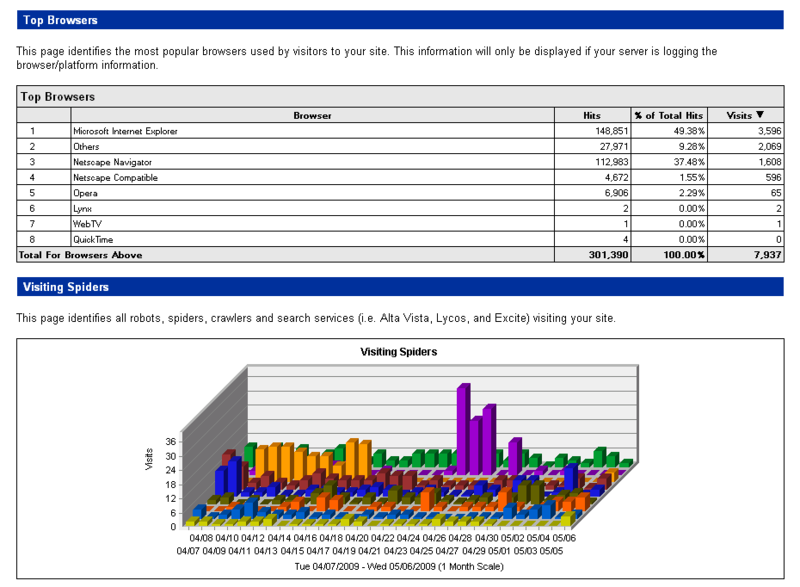 You can also see the number of spiders that visited the site. You want to keep the search engine spiders returning to your site so that your new content will get indexed quickly, helping you with your search engine optimisation. There is a known bug with the "Visits Referred by Search Engines" and this figure should be ignored - use the "Top Search Engines" section instead. 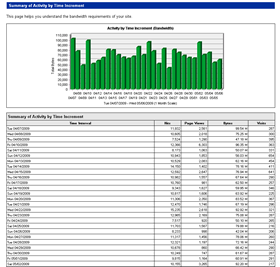 The 'visitors' section refers to the number of unique visitors you receive each month. Unique visitors are new visitors to the Website or returning visitors that haven't visited the Website within the last month. 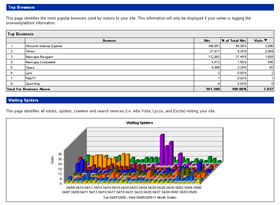 The unique visitors statistic allows you to help monitor the number of new people finding your Website each month. 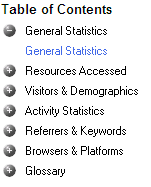 The 'resources accessed' section of the statistics allows you to see which areas of your Website have been viewed by visitors to your Website and what resources (e.g. videos and PDF's) have been downloaded. The 'top pages' section shows you the most popular web pages on your site, how often they were viewed, and the average length of time the page was viewed. The 'top documents' section identifies the most popular documents that have been viewed on your Website, the number of times they were viewed and the average view time. This section includes files such as PDF's. the 'top entry pages' is a list of the pages of your Website that are the first viewed by a visitor to your Website (i.e the landing page). The top page is typically your home page but other pages will also appear in this list as individual pages can rank in the search engine results pages (SERPS). If you are a client that uses our SEO services then you are likely to see a number of different pages appearing in this list. The 'top exit pages' are the last page that a visitor looks at before leaving your Website These can be particularly useful as they can give clues as to why people are leaving your Website, although in most cases they are satisfied with the page and have left the site naturally. The 'most accessed file types' section provides you with a list of the number of times different types of file have been accessed by visitors to the Website. This includes HTML pages, video files, PDF files and more. This section of the Website statistics breaks down all the activity on the server that your Website is hosted on. This allows you to see how much bandwidth is being used as well as providing useful visitor information that is organised by the day of the week, time of day, length of visit and by the number of pages viewed. Bandwidth is the amount of data transferred from the server when visitors go to your Website and begin downloading the different elements of the page such as pictures and video. The greater the bandwidth, the busier the Website. Make sure that any pictures, videos and sound files are optimised to make downloading quicker and to keep any bandwidth charges to a minimum. The "by time increment" is a particularly useful statistic as it allows you to monitor the amount of bandwidth your Website is using each month. You can find this useful information by looking at the bytes column of the table and the total bytes at the bottom. This figure is the amount of bandwidth your Website has used over the last 30 days. When your Website is hosted with Cravenplan you get 1Gb (1,000Mb) of bandwidth included with our hosting package. The 'top referring sites' are the different Websites that have referred visitors to your site. These can be Websites that have a link to your site on them or they can be search engines. This is a very good way of monitoring the effectiveness of any advertising you have paid for on other Websites or directories. You will often see 'No Referrer' in this table and this row is the number of visitors that have visited the Website directly by typing in the web address into an Internet browser or by clicking on bookmarks. It is normal for your site to appear at the top due to the internal links on the site. This is similar to the 'top referring sites' but it gives you the full URL of the page that has a link to your Website on it. The 'top search engines' graph and table shows you the different search engines that have referred visitors to your Website and the number of visitors from Google, Yahoo!, Bing and any other search engines. The 'top search phrases' are the different key phrases that have been most used by visitors to find your site using the search engines. This can be a useful tool as the search phrases you think you are being found for might not always bring in the number of visitors you are expecting. 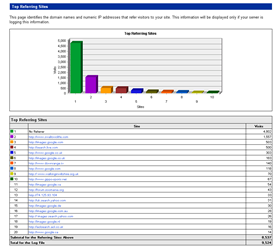 This is also a good way to monitor the effectiveness of any SEO work you are doing. The 'top search keywords' table is a list of the most common individual words contained within search key phrases. This allows you to see how many times a specific keyword can show up in a number of different key phrases. For example the keyword 'Salisbury' is likely to show up in a number of key phrases. 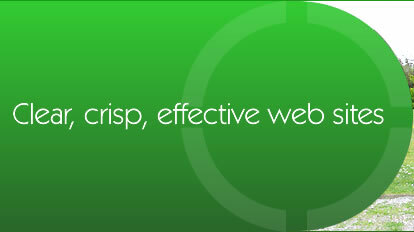 like 'Web Design Salisbury' or 'SEO seminar near Salisbury' for the Cravenplan Website. In most cases, key phrases are more useful than keywords. A browser is software such as Internet Explorer, Mozilla Firefox, Safari and Google Chrome that allows you to view Websites on the Internet. The top browsers table provides a list of the different types of browser that have been used to view your Website. As mentioned before, spiders or bots are programs used by the search engines to visit Websites and find out what they are about and if anything has changed. The search engines then display these details within the search engine results. This list lets you know which spiders have visited and how many times during the last 30 days. If you are finding that you are constantly being visited by search engine spiders then this is a good thing. It means your site is updated often and probably receives a good level of visitors from the search engines. This is a table that identifies the different operating systems that are used by your visitors. This could be platforms like Windows XP, Windows Vista, Linux and Mac.